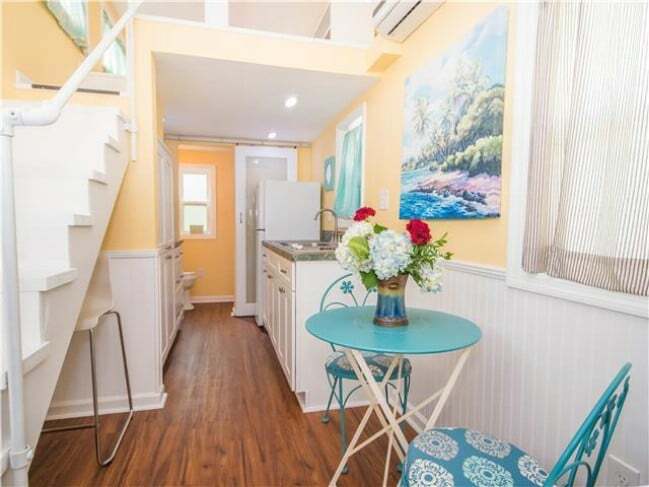 If you happen to be traveling to Sarasota, Florida anytime soon, you should make a point of booking a reservation to stay at Tiny House Siesta. 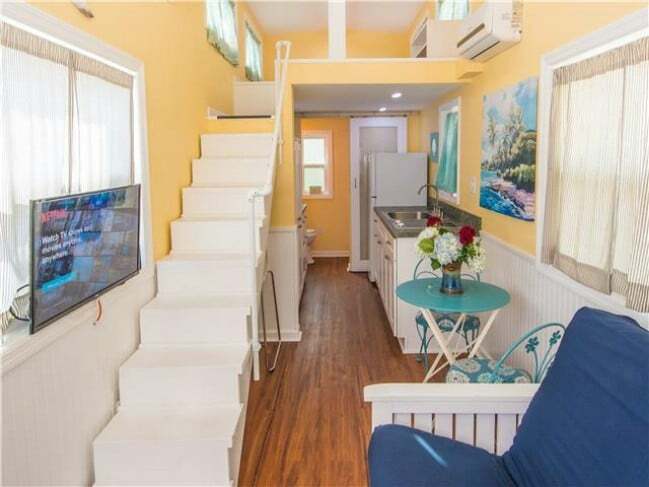 Here you can stay in any of the number of unique tiny beach houses, each with their own layout, decor, and atmosphere. 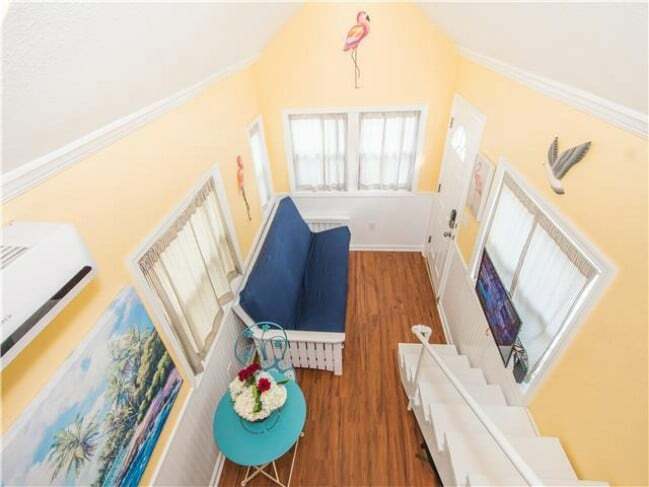 One which particularly stands out is Tiny House Flamingo. 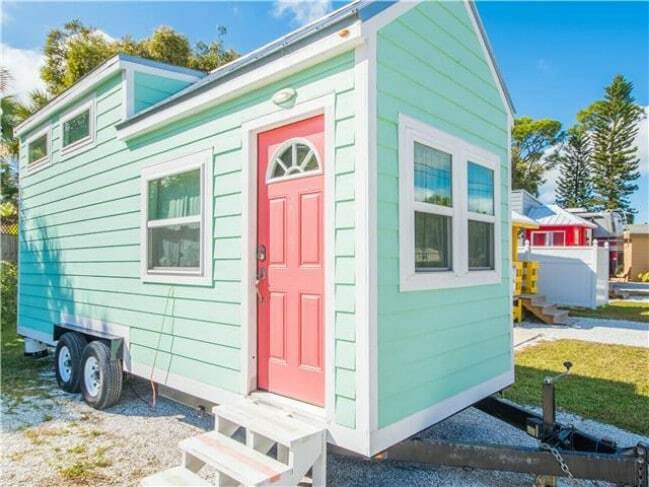 This tiny house features a delightful and distinctive color scheme with mint green siding and a flamingo pink door. The interior of the home continues with the light, beachy colors. The mint green has been replaced by a sandy hue for the interior walls. 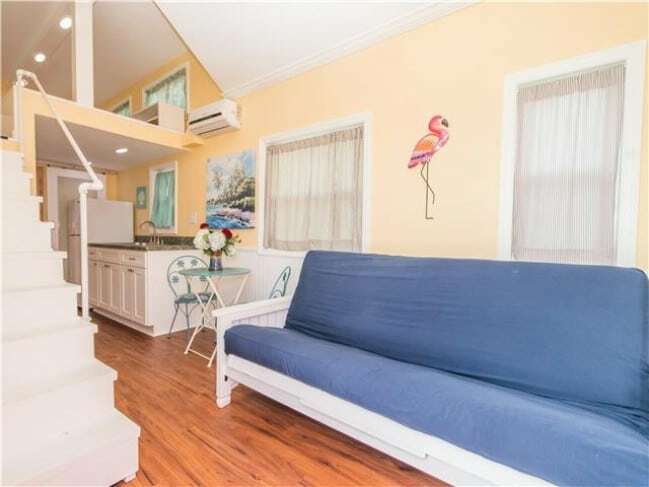 The flamingo theme is expressed through the artwork on the wall above the couch. 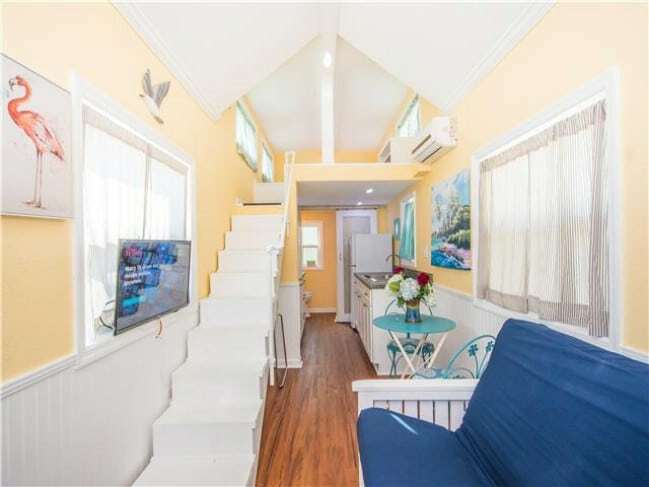 The spaciousness of this tiny house really stands out. It isn’t just the layout which helps to create this roomy atmosphere, but also the airy choice of colors, the placement of the large windows, and the angled ceiling. While the staircase takes up a significant portion of the wall, the elongated steps help to emphasize the length of the home. Ironically, this actually has the effect of making it look bigger. The light blues and the sandy yellow really play beautifully off of each other. Everywhere you look, there’s artwork to remind you that the beach is just outside. In the kitchen is everything you need for a comfortable stay. This includes a refrigerator, a toaster, and even a stove. 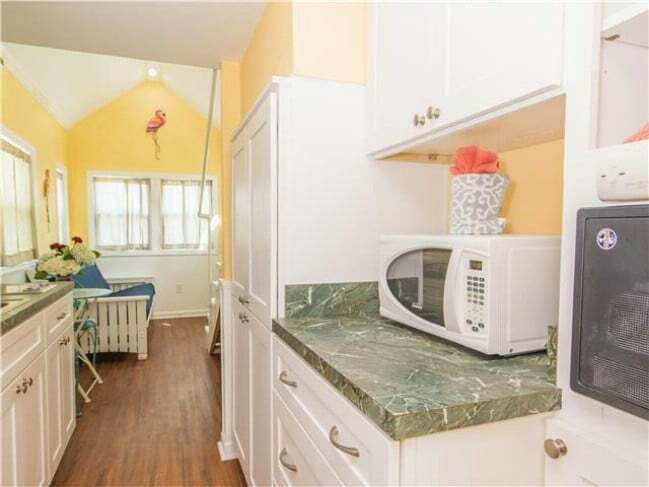 There is also a microwave for reheating food. Kitchen utensils are included as well so that you do not have to bring your own. 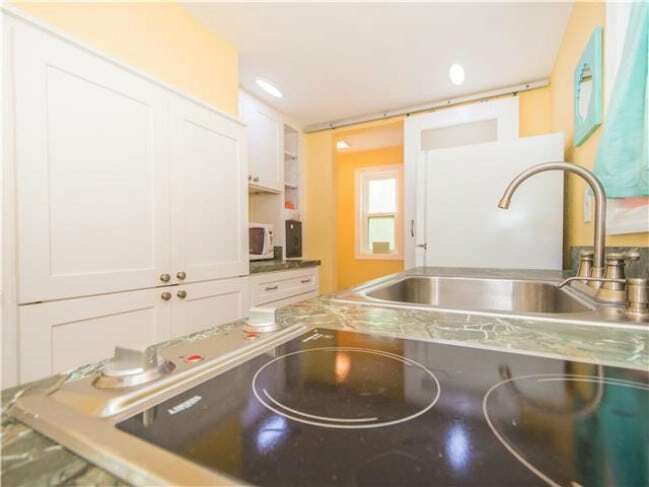 While cooking on a vacation may sound like doing work on time you should be relaxing, this kitchen has such a nice vacation ambiance that it looks like fun to prepare a meal here. You wouldn’t need all these storage cabinets on a typical vacation, although they might come in handy for an extended stay. 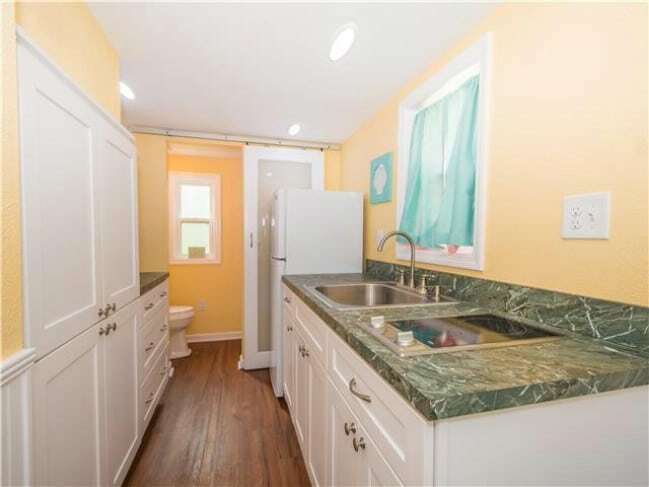 They also do serve to show you an example of the kind of storage that can be packed into a tiny house kitchen, which might be of interest to you if you’re thinking about moving into a tiny home yourself one day. This view looking down from the loft shows off the hardwood floor as well as the layout of the house. 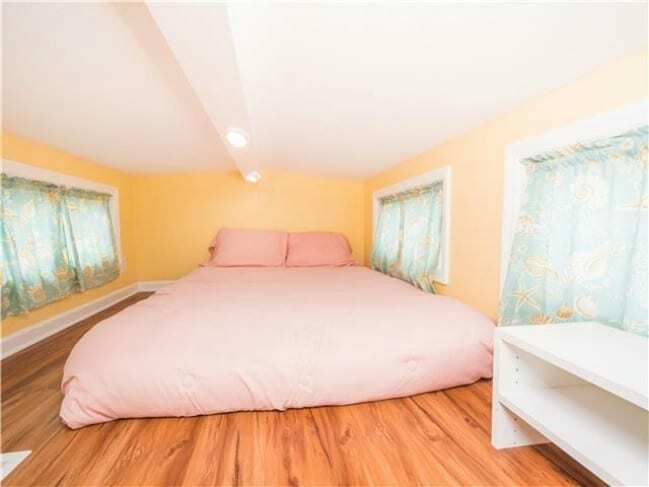 If you don’t like tight spaces, and are concerned that a tiny house loft could be a cramped place to sleep, the spacious loft should lay all of your concerns to rest. 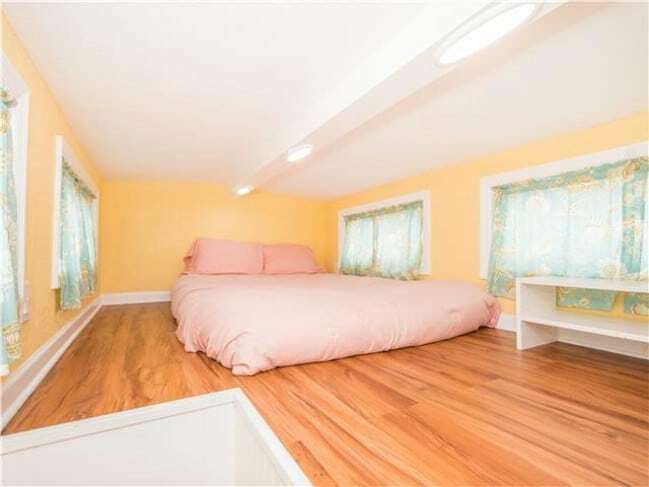 Both the floor space around the bed and the vertical clearance above it are very impressive. There is even space for a small set of shelves. The warm pastel colors continue in the bathroom. 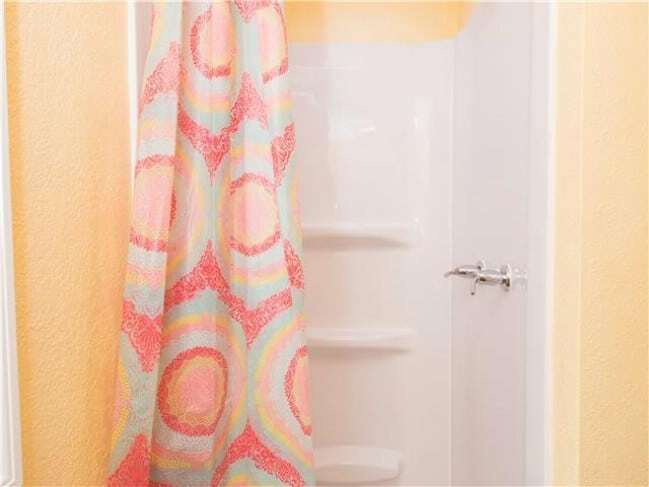 The vibrant curtain is pulled aside to reveal a roomy shower with convenient shelves. If you would like a chance to stay at this amazing tiny house, you can do so for just $115 a night. Place a reservation or learn more at Tiny House Siesta.